An illuminating journey through today's fascinating world of design. What can we learn from the ways great designers think-and how can it improve our lives? 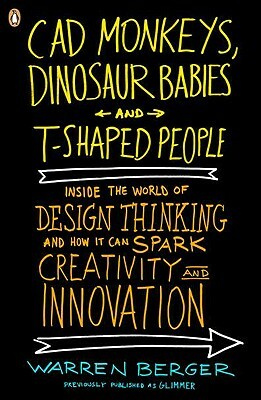 In CAD Monkeys, Dinosaur Babies, and T-Shaped People Warren Berger, in collaboration with celebrated designer Bruce Mau, revolutionizes our understanding of design and unlocks the secrets of the trade. Looking to the creative problem-solving work of design professionals, Berger reveals that design is a mindset, a way of looking at the world with an eye toward improving it. The practice of design-thinking opens readers to their innate capacity for reimagining the world around them. Warren Berger is an award-winning journalist and author who has written for The New York Times Magazine, Wired, GQ, Reader’s Digest, The Los Angeles Times Magazine, Business 2.0, and New York magazine. His work appeared in the 2001 Best Business Stories of the Year. He is the author of Advertising Today, Hoopla, and co-author of Nextville and No Opportunity Wasted. He is also the creator and editor of One, an acclaimed national magazine focusing on advertising and design.